Many of us are using in out day to day life but do we actually make the most out of it ? I have seen people using a software and they are very happy but on real terms we don’t harnesses the power of the software. What could be the reason ? probably we don’t explore it more. By default FDM takes maximum of you download speed when used and hence of you are browsing at the same time , the sites open slow. So if you want to balance it out used the three different modes are available for download, Heavy, Medium and Light, which allow to download at fast speed, medium speed and slow sped respectively. Thus, allowing you to utilize your Internet connection as per your convenience, that is Heavy Mode utilizes the max of your Internet connection for download, leaving other processes at a slow speed, Medium and Light mode work respectively. Now you don’t want to keep on switching from Heavy mode to light every time you browse. FDM gives you a direct option of switching to Light Mode as soon as you start browsing and goes back to previous setting as soon as you stop. Press CTRL + O to open the Download Options Menu and click on Network tab. 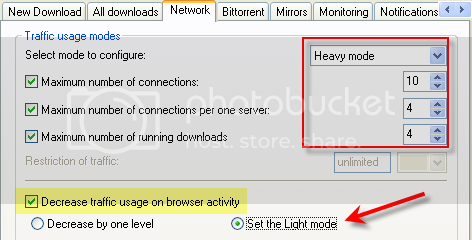 You will find the option “Decrease traffic usage on browser activity”. You can also set the limits of download for all the modes here. 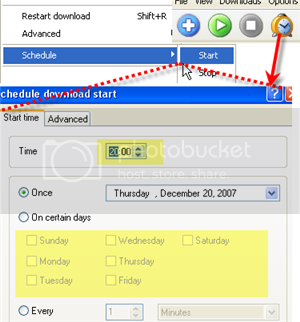 Just right click on the file you are downloading and click on schedule or just click the Clock under options menu. The tabs on the lower part of interface can be used to view progress, preview of media files (which allows you to check, if you are downloading the required file), feedback can be given for any particular file. In case you are re installing your OS and you still have some download left , FDM allows you to export all your settings, List of current downloads and history of downloads. Thus once you have optimized FDM for maximum download you just need to import these settings if you have to reinstall . without necessity to install and configure it on each computer. You may place it on flash disk for example. browsers. And at exit it will un register itself automatically. be the folder on some removable drive. Press CTRL + O and open the options. Select All Downloads and at the end you will see the option where you can set your anti virus program. You might also skip some files like .TXT or .DOC as they are likely not be infected.